Results from a recent citizen survey done by ETC Institute have shown that Oklahoma City residents are happy with the improvements that have occurred in the city in recent years. The survey was conducted last June, and 1,201 people, representing different types of households in the city, participated. According to the survey, residents have a positive view of the city and are satisfied with what they are experiencing. A significant number of residents think that the city is a great place to live and have a career. Emergency response services, such as fire departments and ambulances, and the police force also received a more satisfactory rating than in the past. In addition, customer service in the local government offices has improved, and employees now offer more accurate information and greater assistance, which citizens indicated that they appreciated. Residents were satisfied with utilities like water services, trash collection, and pick-up of bulk items. Satisfaction in public transportation also increased, as did sentiments toward the enforcement of parking and signs in the community. 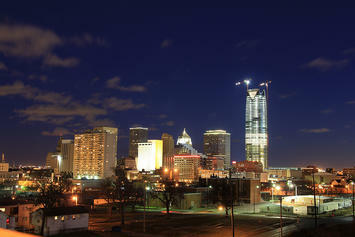 Overall, Oklahoma City ranked above the national average in several aspects. The city ranked 18 percent above the national average in the overall quality of city services. Planning growth of the city ranked 28 percent above the national average. Communication with the public ranked 14 percent higher than the national average. The main thing residents remained dissatisfied with was street maintenance and traffic flow.